Roulette is a game that has been around since the early 18th century in France. The first mention of the game was in a French novel in 1796. Since that time, Roulette has become a popular game throughout the world. It is a game that many flock to when first entering a casino. There are several variations of the game, including European Roulette, French Roulette, and American Roulette. As well playing the game in a casino, you’ll also be able to enjoy the games online. 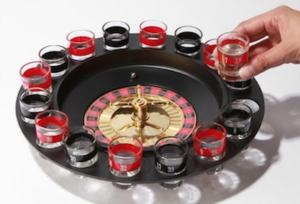 One fun variation of the game is Shot Roulette – alcohol based roulette! 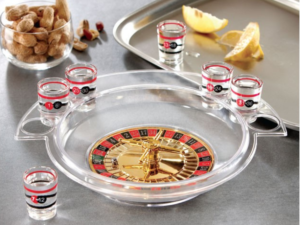 The game features a roulette wheel with a number of shot glasses around the edge of the wheel. Each of these glasses will have two numbers on them which will correspond to the numbers on the wheel. There are no set game rules in shot roulette, so here are some suggested ideas. How Do You Play Drinking Roulette? Spin & Drink: Each player takes a turn spinning the wheel and will drink the contents of the appropriate glass. If the contents of the glass have already been consumed, that player will not take a shot that round. Continue until all of the shot glasses are empty. Pick Your Glasses: Each player takes possession of a number of glasses – if there are four players, then four glasses each would be a good number. The wheel is spun, and the owner of the relevant glass will then down the contents of the glass. This version has the advantage over version one in that nobody will be required to drink more than four shots and possibly make a complete fool of them self. Mix & Match: Place a different spirit in each of the shot glasses and enjoy a different drink with every spin. Alternative: Only pour liquor into some of the glasses, which will make for a longer game. You could fill the other glasses with non-alcoholic drinks. There is a turbo version of the drinking roulette game, which will be good for players who don’t have as much time. Wam: Fill the shot glasses with your alcohol of choice (of course you can vary this from glass to glass). Bam: Leave the roulette wheel in the box. Thank You Ma’am: Drink the contents of the glasses. You are playing Shot Roulette with friends, and you go a little too far. You’re at the stage where you’re being a bit loud and you think you have mastered the art of singing. You think you are so good that you ask one of your friends to record you singing on their iPhone. The ‘friend’ who records you has been particularly lucky at Shot Roulette and has only downed one shot –as opposed to your seven– so has a very steady hand when recording you. Your powerful rendition of I Will Survive ends. Then you decide that you do indeed have the Moves Like Jagger and incorporate some dancing into your solo. The recording ends with you declaring your undying love to all of those around you. The recording over, you decide it will be a great time to have a sleep on the bathroom floor. Fortunately, you wake up the next morning to find out your recording career hasn’t been in vain. You have caused quite a stir on Facebook. Not only have two ex-partners left comments, but so have your 72-year-old grandmother, your dad, and your boss. The clip goes viral, and not only are you now world famous, but there are others who have become famous on the back of it, by performing ‘spoof’ renditions of your rendition. Obviously, that was a fun look at the dangers of playing Shot Roulette. However –as is the case with any drinking game– there are real dangers involved so drink in moderation and know your limits. Want to play live dealer roulette instead? BetOnline is one of the most popular US online casinos. New players can take advantage of their great 100% up to $1,000 welcome bonus. You can also take part in the Live Casino Weekly Challenge – win up to $1,800 in cash every week you place in the top 3 on the roulette or blackjack leaderboards.